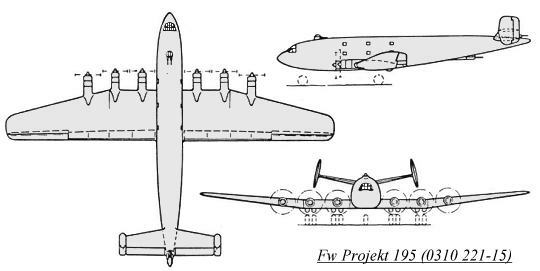 The Focke-Wulf Projekt 195 (drawing number 0310 221-15) was to be a very large capacity, wide body, all metal construction transport aircraft, submitted to the RLM in August 1941. Also known as the Focke-Wulf Fw 249, this was not an official RLM designation. It was designed to take advantage of the Jumo 222 engines (24 cylinder - 2500 horsepower), which were in development at that time. The wings were placed low on the fuselage, and had eight Jumo 222 engines mounted on the wing leading edge. A twin fin and rudder configuration was chosen for the control unit. A tricycle landing gear arrangement was designed, so that a rear loading ramp could be used. A total of 52 tons of equipment, or 400 fully equipped troops could be loaded. The Fw Projekt 195 was to be manned by a seven or eight man crew. The Jumo 222 engines never reached production status, due to their very complex construction. The few that were ever built and tested exhibited many teething problems. This engine was chosen for the Bomber-B program (the competitors for this contract issued in 1939 were the Arado E.340, Dornier 317, Focke-Wulf 191, Junkers 288). Due to the troubles with the Jumo 222 engines, and no other suitable engines with the same power, the Fw Projekt 195 construction was not pursued. It would have been the largest land aircraft in the world at that time. 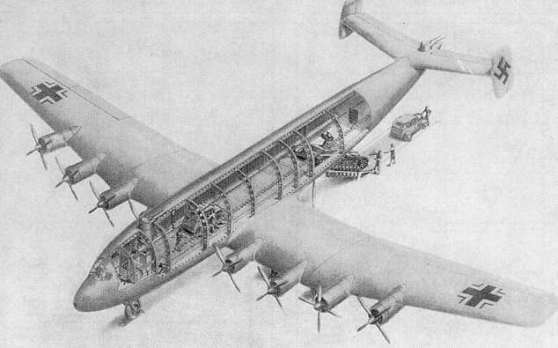 A later design with only six Jumo 222 engines and a reduced payload of 40 tons, was also canceled because of the unavailability of suitable engines.